Our range of products include spray perfume fragrances. Our name has remained synonymous in the global market by manufacturing and exporting a premium range of Spray Perfume Fragrances. These fragrances are highly aromatic and possess sooth aroma, thus are largely demanded to fragrant perfumes and body spray. 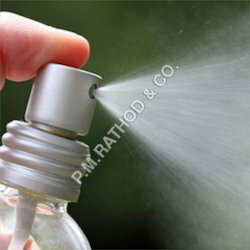 In order to process these Spray Perfume Fragrances, we use top quality ingredients and essential oils. Furthermore, to attain maximum satisfaction of the patron, our range is delivered to their destination in stipulated period of time. Looking for Spray Perfume Fragrances ?